::: Off the Radar :::: EROL ALKAN & FRIENDS TONIGHT @ THE VAGABOND!! 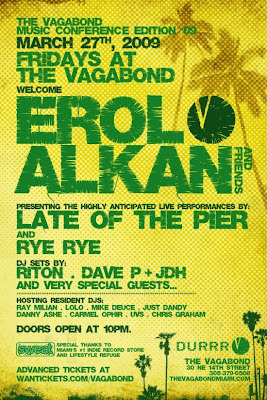 EROL ALKAN & FRIENDS TONIGHT @ THE VAGABOND!! Sorry haven't been posting much lately, just been crazy with WMC and all. Promise I'll be back to my regular schedule next week when all the WMC craziness is over. Had a great time yesterday for the Sunset Cruise w/Sasha & Digweed! In addition to the great music there was an Open Bar & Free Buffet! Can't go wrong with that and there ain't too much Free stuff for WMC. They played this Frankie Knuckles Remix of Depeche Mode's new track 'Wrong' that was pretty sweet. Right when the sun was setting and everyone was dancing on the top deck of the yacht. Pretty memorable! The underground is taking over @ Ultra this year too. For the first time there's Indie/Electro Acts at Ultra Saturday. They had been doing the same stale big name DJ's for years. This year they got Simian Mobile Disco, Cut/Copy, Booka Shade, The Presets, Boys Noize, what??? Yep, they're catching on. The underground is getting to the masses. About a year or two behind of course. Tonight @ The Vagabond there's one of the better WMC Events this year with Erol Alkan & Friends. There's gonna be Live Performances by Rye Rye & Late of the Pier! Here is the line-up for Tonight's festivities, plus a few MP3's to get you excited, although the line-up alone should do that. Hope to see you all Tonight!! P.S. Be sure to arrive early!!! Doors Open @ 10 PM. It get's packed there every Friday, so I'm kinda scared of how crazy it's gonna get Tonight. I think I'll be spending a lot of time behind the DJ Booth, hopefully more space back there. Now let's have some FUN!! If you like Riton, then don't miss out on Kitsune Maison's warehouse party on 31 October in East London!!! Riton, Gildas & Masaya and Le Corps mince de francoise will be dj:ing!